Marching Cobras of New York. Commissioned by Storefront for Art and Architecture, 2017. As part of Marching On: The Politics of Performance, Storefront collaborates with Performa to host a salon series at the gallery space exploring the politics of performance. A corresponding performance by The Marching Cobras of New York is presented on the Saturday and Sunday before the event at Marcus Garvey Park in Harlem. The event is free and open to the public, and is part of Performa 17. See here for more information. African-American marching bands have long been powerful agents of cultural and political expression, celebrating collective identities and asserting rights to public space and visibility. With Marching On, Bryony Roberts and Mabel O. Wilson, professors at Columbia University’s GSAPP, collaborate with the Marching Cobras of New York, a Harlem-based after-school drum line and dance team, to explore the legacy of marching and organized forms of performance. 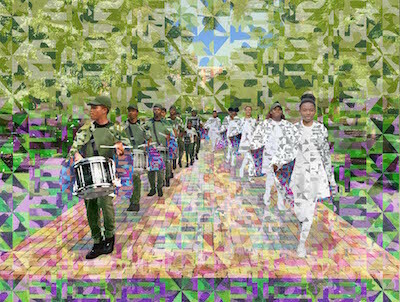 Commissioned by Storefront for Art and Architecture, this new project interweaves echoes of the 1917 Silent Parade against racial violence with references to the revered Harlem Hellfighters in order to celebrate the crucial role of the community’s collective performances as acts of both cultural expression and political resistance.